Video game legend Ralph Baer passed away this weekend. If you don’t know who he is, I recommend watching this short video by PBS. As you’ll soon learn, much of what we do in the video game industry is a direct result of many of his inventions. I was fortunate to have spent a Sunday afternoon with him earlier this year at his home in New Hampshire, where he agreed to be a guest on my podcast and show me around his workshop. 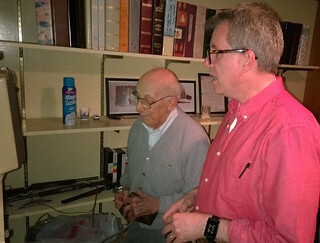 Here is a never before seen photo of Ralph and I in his lab, playing on the “brown box” – the prototype that would go on to become the Magnavox Odyssey. It was a magical afternoon that I shall remember for the rest of my life. Thank you for everything Ralph and rest in peace.